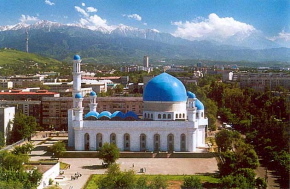 Mosque in Almaty (source: Embassy of the Republic of Kazakstan, Beijing, China). At the beginning of December the authorities began testing the imams or mosque prayer leaders across the South Kazakstan region, which adjoins Uzbekistan. One by one, the mullahs were called before the Religious Board of Muslims, a state-sanctioned body placed in charge of Islamic matters, to be questioned on the finer points of theology. The official clerics say the problem is that mosques have been springing up all over the place, and the people in charge of are not sufficiently versed in the tenets of Islam. “Unfortunately, the Religious Board has had a lot of complaints about imams who don’t even have a secondary-school secular education,” said Abdulla Bakhadyr, spokesman for the Regional Imam’s office. He warned that anyone who failed the exam would be banned from preaching and leading prayers. The procedure has a distinctly Soviet flavour to it – with the religious watchdog of a secular state deciding who it will license to represent Islam. According to political scientist Igor Savin, it is not within the Religious Board’s remit to appoint or dismiss preachers, and in any case it is common practice for congregations to pick their own imams. Savin says the move is clearly part of a government campaign to get a firmer grip over Islamic groups, in the wake of recent revelations that militants may be active in the south of the country. “This is the authorities’ reaction to the National Security Committee’s discovery of a terrorist organisation in Kazakstan,” he told IWPR. But in targeting all imams, he added, the authorities are “nevertheless violating the constitutional rights of believers”. In a parallel process, the regional authorities are requiring all mosques and religious organisations to register with the government. “Mosques and other associations which have not registered with justice [ministry] authorities by the beginning of December will be closed,” said South Kazakstan governor Bolat Jylkyshiev. The theology tests began only three weeks after the National Security Committee or KNB announced it had broken up a radical group linked to al-Qaeda, arresting 13 people. On November 11, KNB deputy chief Vladimir Bozhko named the group as the Mujahedin of Central Asia and said they had been planning to cause explosions in both Kazakstan and Uzbekistan. Uzbekistan, more than any other Central Asian country, has an ongoing confrontation between Islamic opposition groups and the government. The courts have jailed thousands of people in an effort to combat Hizb-ut-Tahrir – a banned but still active group which professes non-violence – and in previous years the armed Islamic Movement of Uzbekistan. After several days of violence in the Uzbek capital Tashkent in late March-early April, and three nearly simultaneous suicide bombings in the city in July, the Uzbek authorities suggested that this apparently new wave of Islamic radicals were either nationals of Kazakstan, or were taking advantage of its more liberal society to hide out there. Last week, Radio Liberty reported an announcement from the Uzbek prosecution service that all three suicide bombers were Kazakstan citizens. Until this year, Kazakstan’s government took a less repressive line on unauthorised Islamic groups, in part because Kazaks – who are Sunni Muslim by background like other Central Asians – have no record of religious militancy. Some 30 people have been arrested for distributing Hizb ut-Tahrir leaflets this year, but that figure is low compared with the thousands detained in Uzbekistan in recent years. But Kazak leaders are clearly under pressure to act, both to ward off possible violence at home and to assuage the concerns of Uzbekistan. In October, the authorities outlawed Hizb ut-Tahrir, whose existence they had previously tolerated even though the group is banned in Uzbekistan and Kyrgyzstan. On December 6, it was announced that Vadim Barsenov – a leading Hizb-ut-Tahrir activist – had been arrested in the southern city of Shymkent and charged with inciting religious and ethnic hatred. Barsenov is a Russian who has converted to Islam. The authorities are clearly trying to achieve a lot more than encouraging clerics to develop a better knowledge of the Koran. One indication is that during the examination, imams are asked which mazhab or school of Sunni Islam they prefer. The right answer is presumably the Hanafi school prevalent in Central Asia; naming a different school would suggest the cleric may have been influenced by foreign Islamists. The aim seems to be to use imam-testing and mosque registration as a way of identifying people with possible subversive links. Last month, Vladimir Nakisbaev, the KNB chief for South Kazakstan region, spoke of the need to keep a close eye on “unregistered religious organisations” active in the province. The South Kazakstan region has a large community of ethnic Uzbeks as well as Kazaks; the former have traditionally tended to be more observant Muslims. Since Kazakstan became independent 13 years ago, the number of mosques has quadrupled. As well as home-grown mosques, the security services are also keeping a close watch on education programmes run by foreign charities such as Jamaat al-Islah al-Ijtimai and the Ibrahim Foundation. The KNB has said schools funded by such organisations are covertly teaching radical religious ideas. Earlier this year, the Kazak education ministry ordered the closure of the South Kazakstan Humanitarian Academy following media reports that the institute’s curriculum was heavy on Islamic content and was being funded by Jamaat al-Islah al-Ijtimai – the Social Reform Society – a Kuwaiti charity which Russia listed as a terrorist organisation last year. The Muslim Religious Board says 101 mosques – a fifth of the total in South Kazakstan – have failed to place themselves under its authority or to register with the government; nor are the documents for the land they are built on in order. Clerics at such mosques say they can’t get the right documentation because of the huge amount of red tape in their way. When the congregation applied for registration with the authorities, they were refused. So the mosque is now described as a community centre, although everyone still goes there to pray. When an IWPR contributor reminded him that religion is separate from the state in Kazakstan so the government has no right to close mosques, Nurmetov hastily added that people would find it more convenient to get together in one big mosque. In another village, Mankent, a 46-year-old imam who asked not to be named said that by getting tough on religious groups, the Kazak government was simply repeating the mistakes of neighbouring Uzbekistan. The more the Uzbek authorities applied brute force to Islamic organisations, he said, the greater the counter-reaction from increasingly radicalised groups like the IMU. “While the harsh measures taken by [Uzbek president Islam] Karimov’s regime against Islamic extremists led to them being forced to leave Uzbekistan, hasty attempts by the Kazakstan authorities to assume rigorous control over the activity of religious organisations may cause a negative reaction from Muslims,” he said. Olga Dosybieva is an independent journalist in Shymkent.